Today we’d like to introduce you to Rebecca Schoenberg. Rebecca, please share your story with us. How did you get to where you are today? 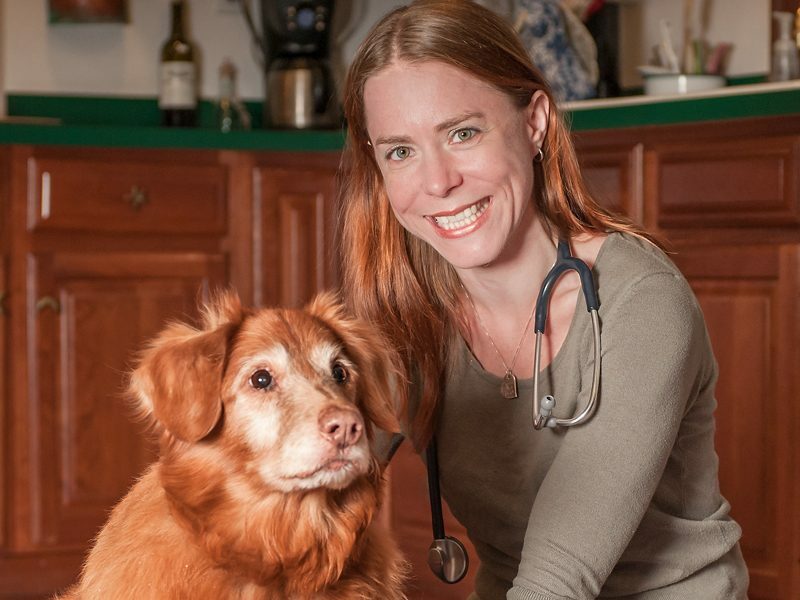 I run a mobile veterinary practice providing house calls for hospice care and end-of-life care for chronically or terminally ill pets and the people who care for them. I have always been interested in, and focused on, the emotional aspect of veterinary medicine – every pet has a family that loves them, and often that can be forgotten in the rush of traditional medicine. For years I struggled to find the time, in daily practice, to give my older and sicker patients and the people who cared for them the time and dedication they deserved. Three years ago I read an article on hospice medicine as an emerging field in veterinary medicine, and it resonated deeply with me. After several months of wishing I could be part of that field, my husband and friends convinced me that I could start my own practice. I spent the rest of that year studying pain management, grief counseling, and business management, talking to and learning from other people in the field, and planning; two years ago I opened my doors (metaphorically speaking) and started formally practicing hospice medicine. Now my hospice practice is full-time, and I’m currently enrolled in the world’s first formal certification program for Animal Hospice and Palliative Care. There are a few struggles in a field like this. Animal hospice is a very new area of practice, so not a lot of people are aware that it’s available as a resource. It took a little while to get the news of this field to the people and pets who need it. The other biggest struggle is work-life balance. Hospice care doesn’t stick to a planned schedule; my patients and clients often have urgent or unpredictable need for me and my services, so it can be difficult to find enough time to care for myself as well as my patients. Please tell us about Autumn Care & Crossings. My business provides in-home veterinary care for elderly pets and chronically or terminally ill pets, as well as the people who care for them. My primary focus is on providing the best possible quality of life for those pets, focusing on their comfort and happiness, as well as supporting and caring for the emotional needs of their caregivers. This care can take the shape of giving medication for pain or other physical symptoms, educating the family on the course of illness, supporting them through the grieving process, suggesting changes to the diet or environment to improve a pet’s comfort, teaching caregivers how to recognize changes in their pet’s condition, and helping plan and prepare for their end-of-life. What makes us stand out from traditional medicine is the focus on both the people and the pet as a patient – the emotional impact on a caregiver facing a beloved pet with a terminal diagnosis is immense, and it’s important to focus on their needs as well as the pets. I’m also able to devote a great deal of time and energy to each family. More than anything, I’m proud of the way I’m able to take a potentially painful situation, both physically and emotionally, and bring comfort and ease to the families I work with. I would have had more confidence in myself. When I started this practice I had a list of contingency plans for how I would adapt if things didn’t work out – I never planned ahead for how I would progress if I succeeded.